On the day that MadPriest and I were to meet in Newcastle, I left Leeds on the 9:05 AM train. MadPriest told me that I had to be on that train. We'd had the near miss in our previous plan to meet at Thornaby, and neither of us wanted a repetition of that. Before the alarm went off at 6:00 AM, I awoke at 4:00 AM, anxious about the train, I suppose, and there was no falling back to sleep. I had lots of time to get dressed and drink my tea in my room and eat my cereal bars and an apple in good time to get to the train station by 8:00 AM, which I thought would be enough time to buy my ticket and find the right platform. It was. Once I boarded the train, I dutifully called MP to tell him that I had caught the right train at the right time, and that I was on my way to Newcastle. I'm not sure I remember the exact sequence of events after I arrived in Newcastle, but I believe we walked from the station to the River Tyne, along the river (a lovely walk!) to the pedestrian bridge to the Sage Music Centre. 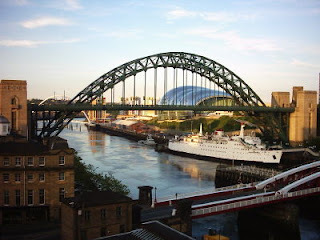 The picture at the head of the post shows the river, the Tyne Bridge, a graceful structure, and the arched roof of the Sage beyond the bridge. We bummed around in the city center, saw one of the oldest buildings in the city, a timbered structure, and many handsome buildings in the classical style, which were built in the 19th century. Newcastle is a compact city, and I liked that. MadPriest is an excellent guide. You'd have thought he was a professional. If memory serves, The Cathedral of St. Nicholas was the next stop. The cathedral calls for a post of its own. There's so much to see there that this would be the post without end if I described and linked to the highlights there. It's well worth a visit. All this before lunch. We stopped for a cuppa, tea for me, coffee for MadPriest, and to rest the feet, and then we were off to meet Mrs MadPriest for lunch at the university. After lunch, it was on the bus to MadPriest's shrine house, into the car, and on to Hexham Abbey, on the site of an ancient church built by St. Wilfrid (I know. Lotsa links, but it can't be helped.) 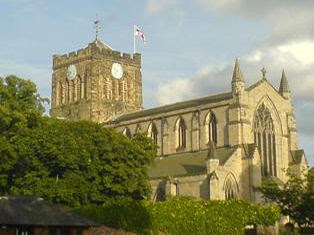 in the 7th century, which is also the present Parish Church of St. Andrew. What a magnificent structure, part quite old, part not so old, but all-around wonderful. At first, one of the guides took us around. She was pleasant enough except when it came time for us to go down into the crypt. 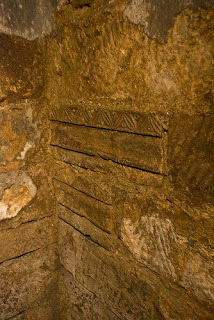 For visitors who come to Hexham Abbey in search of the past the greatest thrill of all is the Anglo-Saxon crypt. A steep stone stair descending from the nave takes you back thirteen hundred years, into rooms and passageways left intact from St Wilfrid’s original church. The only comparable crypt is beneath Wilfrid’s other great church at Ripon. Everything that he built above ground at Hexham has gone, except for carved fragments set in the walls of the nave. Only his crypt is essentially as it was first built. She blocked the gate to the stairs down to the crypt until she recited her entire long-winded spiel. What an inspiration to watch MadPriest fight a valiant inner battle for restraint, as the lady droned on and on. In the end, he won the battle and did not shove the old lady out of the way. She did not even mention some of the coolest things we would see down in the crypt. Once again, MadPriest was an excellent guide, much better than the real guides. Inside Hexham Abbey Crypt. Note the various stones in the wall... all reused from the Roman settlement at Corbridge, some 3 miles away. Photo and quote from Sokabs at Flickr. The decorative stones set in the midst of rough stones took my breath away. I know that sounds like hyperbole, but it is not. Below is the stone stairway in the abbey. 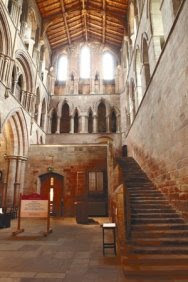 Thirty-five worn stone steps rise from the south transept of Hexham Abbey, leading to a broad gallery behind a stone parapet, with three doorways opening from it. People have used this Night Stair through eight centuries. It was probably built early in the 13th century by masons working for the team of canons who then lived and prayed in the Priory. I won't say an unkind word about the other guide lady in the abbey, because when nature called rather insistently, she permitted me to use the church choir's private loo, which is through one of the doors at the top of the the worn, uneven stairs. She volunteered that the choir, along with the crucifer, processed down the stairs at the beginning of services. The stairs are quite a challenge without a cross in hand. Just sayin'. I'm giving just a few of the highlights of the riches to be found in a visit to Hexham Abbey. What can I say? Read more about it, or go visit yourself. The post is running long, so I will hurry through the visit to St. Oswald's Church, which I was quite pleased to see, although, to get there, I had to walk across a field in a gale wind which included a light rain on the way back to the car. My knees are bad, but I can still walk. 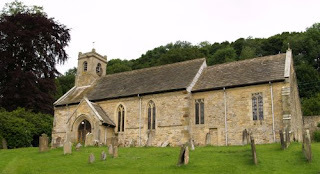 The Battle of Heavenfield, between Oswald, King of Northumbria, and his soldiers, against the Celtic king Cadwallon and his men in the 7th century was fought on the site of the church. Oswald prayed to God to win the battle, and he did, although he fought, it is believed, against superior forces. God was on his side. The earliest church was built in 1140, with reconstructions over the years. At the time of the visit to the church, I couldn't keep the history straight, and I probably caused MadPriest a good bit of frustration, but after doing some homework, I believe that I have a better grasp of the sequence of events. After our windy and wet walk across the field to the car, we returned to MadPriest's shrine house. Mrs MadPriest was home, and I had a glass of wine and a delicious Yorkshire cheddar and good brown bread sandwich, fixed by the hands of MadPriest. It was just what I wanted. I left a only small corner of the bread on the plate. I should have wrapped it and taken it home with me and bought a small reliquary for the bits of bread. MadPriest will be canonized one day, don't you think? Perhaps even by Rome if he decides to swim the Tiber like his mentor John Henry Newman. If he deserves sainthood for nothing else, he should have it for his kindness and graciousness in his long day with me. He and Mrs MadPriest are lovely people, and it was a great pleasure to meet them. Before I left, I managed to break their towel bar, (or re-break it, for Mrs MadPriest told me that it had already been mended) and nearly forget my HANDBAG at their house, which would have meant that I'd have missed my train, which I caught with only minutes to spare, and stretched out the day even longer and caused further complications in the lives of MadPriest and his missus. Thanks again for a lovely day, you old curmudgeon. I became a bit soppy there for a spell, and I know how you hate that. He can be so lovely. But don't tell him. You went round my old stomping ground - I did my first year of teacher training in Hexham(1970-71), and usually attended the Abbey for Sunday Evensong. The following two years (71-73) were spent at Ponteland, 8 miles outside of Newcastle, and I would go into the city at least once a week to shop and have a Viennese coffee in Fenwicks department store. In 73 I went to the Theatre Royal and saw the English National Opera perform Wagner's "The Valkyrie" in English, which was a magnificent evening! I still have fond memories of Newcastle Amber Ale with its distinctive blue label (rather than the usual Newcastle Brown!) and of going to Northumbrian Folk evenings. We also went to weekly Trad Jazz nights at one of the pubs in Ponteland. On a minimal student grant we needed to down as much alcohol for as little money as possible, so we drank a pint of cider into which we poured a shot of whisky, gin and vodka! It was lethal but lasted all night! Ann, I'm afraid that I already have told him, and I know it's terribly embarrassing. SR, I enjoyed your trip down memory lane quite a lot. I'll have to go back. Why did I wait so long to visit the north of England? I've never heard a live performance of Wagner, but I'd like to. I know that I'd like the jazz and folk performances. The lethal drink sounds like something to be avoided at all costs, as I'm sure you do now, and I don't know about the ale, either. The one time I tasted it "over there", I didn't much care for it. Maybe it was bad ale. Mimi, how wonderful to see that part of England through your eyes. I was particularly taken by the stone steps of Hexham Abbey. I can just imagine having to go up and down them in the night hours. It does sound as though MP is an old softie at heart, but I won't tell him. Ah, MA, I don't know if I would go quite so far as to say that he's a softie. That would be stretching it a bit, I think. This was fun, Mimi, on several levels. I enjoy your travel narratives a great deal. When I was in Northumbria in 1997 I got to visit St Oswald's and prayed there, and Hexham which was cool (in spite of its relationship with that awful Romanizer Wilfrith, harrumph). It's fun to see photos of places I have also been and remember my time there. Really, you don't think he's a softie when he posts all those prayer requests and helps out the Padre with his leave and all. Most curmudgeons have a nice soft spot they don't want others to know about. The word "dilettante" was coined for me. MA, what I really mean is that I wouldn't want MP to know that I said he was a softie. Who knows? He might read this post and comments. Very nice "Road-movie" post. Lovely to see the pictures! MP is one of the most charming Neanderthal men I've ever met, but don't tell him that or he'll only get all puffed up. Lovely pictures. Thanks for the tour. Elizabeth, that's about right. I won't tell, because we surely don't want him puffed up. I confess that none of the pictures are mine. This adventure was on Friday, but I ran out of energy for taking pictures on Thursday. I wanted to BE in the moment, rather than RECORD the moment. I had permission to take a picture of MadPriest, not to share, only for me, but I forgot to do it. Göran, we had Dorothy Lamour (me) and Bob Hope (MP), but Bing didn't show. Mimi, I am so glad I was not consuming liquids of any sort when I read your Dorothy and Bob line. I so look forward to the movie! I may rummage for my photos taken when I was there. We had a beautiful day at Heavenfield (St Oswald's). Paul, we could have used Bing for a song or two. I remember how we looked forward to the "Road" movies when I was a kid. Please rummage for your pictures, if it's not too much trouble. I'd love to see them. The wind was so strong as we walked across the field near St. Oswald's that I thought I might get blown flat a couple of times. You certainly should have taken that piece of bread home with you. One day, the face of Jesus would have appeared on it and you could have posted it on Maddie's blog. Erika, I never even thought of that. After that, I could have auctioned off the crust of bread on eBay and made money. Thanks for this excellent account. The Mad One really is a great guy. "The wind was so strong as we walked across the field near St. Oswald's that I thought I might get blown flat a couple of times." Mimi, did you dare to take MP's hand during this gale? Although at an unstable (physically) point in my life I put my name down for the Hospitality Club so wonder if I may see any of your readers one day! As a liberal Anglican I feel a bit lost coping with the Episcopalian mind set, must investigate! Hi Anonymous. MadPriest is Fr Jonathan Hagger. You can find his blog here. There is more than one mindset in the Episcopal Church. I am a progressive Episcopalian. You and I would likely have similar mindsets.